It's a basic mathematical tool, but learning the right way to use a calculator is as important as having one on hand. This chapter teaches calculator essentials such as addition, subtraction, multiplication and division, plus working with decimals. Step-by-step instructions also explain the process of converting fractions to decimals and back again. 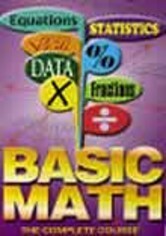 With the Basic Math series, learning to work with numbers has never been so easy.